Creating new habits isn’t easy. Here are six simple hacks that will make it a little easier. Let family and friends know what new habits you’re trying to establish. They will call you out if you don’t stick to your plan and help get you back on track. You may even go as far as sharing it publicly on Facebook or write a blog post about your new journey. Knowing that others read it and know about it might be just enough to keep you going when you feel like throwing in the towel. Whenever possible, add the new habit to one you already have. For example, if you fix a cup of tea or coffee at 4pm, and you want to get in the habit of taking a daily walk, make the new routine to go for your walk and then come back and enjoy your tea. It’s much easier to amend an existing habit than create an entirely new one. Here’s a fun idea heard from a friend . . . Put a jar on the kitchen counter and each time you slip back into your bad habit or forget to stick to the new one you have to put five dollars in the jar. It will quickly help you remember to skip that sugary food and motivate you to go out for that walk. Find someone with the same or similar goal. This could be a workout partner or a diet buddy. Keep tabs on each other and encourage each other to keep going. It’s much harder to skip a walk if you know someone else is depending on you being there. A little accountability can make all the difference in the world. If one accountability partner is good, a whole group has got to be better, right? And they don’t even need to be local! Find a supportive group online (hello Facebook group!) and challenge each other to stick to your new habit for the next 30 days or so. Not wanting to be the first one to give up will keep all of you going until you establish that new habit. Still need some ideas or help? 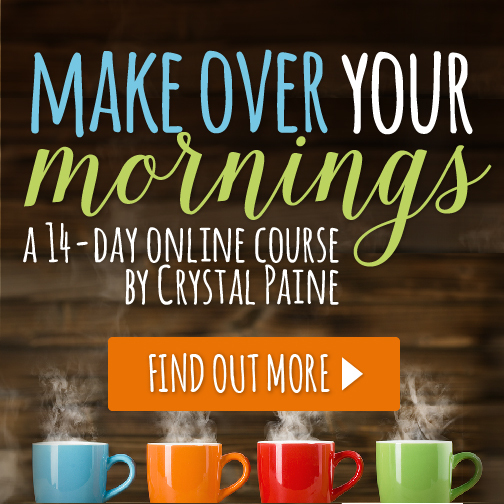 Check out Crystal Paine’s Make Over Your Morning Course. This simple course revolutionized my days! What do you do for accountability? Tell me about in the comments below!